We all have our own little rituals and lists of things-to-remember and things-to-do before and during concerts. We do it to make sure that everything goes as planned because, as we all know, concert tickets aren’t cheap and we don’t want to go home without taking full advantage of what we paid for. Some of us go through the setlist, some of us make a list of all the merch we plan on buying, some of us pick out our outfits the night before, some of us binge watch live videos to hype ourselves up – the list is endless. While we all do it differently, it’s always fun to share our own ways of preparing for a show. 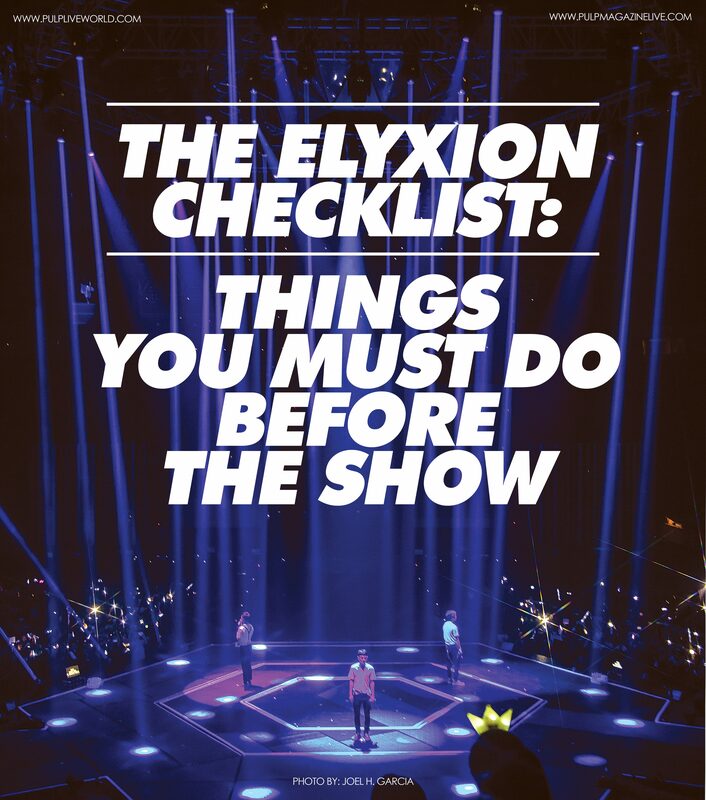 That’s why we made this checklist for tomorrow’s EXO Planet #4: The ElyXiOn. Read on, and share how you do it in the comments section. Prioritize comfort before style. It’s a dream come true to be noticed by your EXO, but don’t compromise comfort! You don’t want to look haggard when he sees you, right? Ko Ko Bop outfits could be a good choice, but remember that it’s cold inside the arena! Prepare a handy list of all the giveaways you want to join! Make sure to follow all the mechanics. Let’s make it easy for everyone! If you want, be an angel to your co-Eris and share your blessings (a.k.a. merch). Sharing is caring. Remember to socialize. Concert day may be the only chance to meet your co-Eris and other mutuals who share the same love as you. Meet them and share unforgettable memories! Do your homework. Singing your heart out is the way of PH EXO-Ls to have fun! BUT It is also important to know the fanchants, when to keep quiet, and to savor the moment. Check the concert setlist and practice with your ElyXiOn playlist. Scout for the perfect spot. To have a better view of your bias during the con, stage maps and fancams from other stops are available online. Look them up, know where your eyes should go, and achieve that Cloud 9 feels! Remember to participate in the Official Fan Projects approved by Pulp and SM Entertainment. Show them the power and unwavering love of PH EXO-Ls! Cooperation and fandom unity is a must. Practice those dance moves. Dancing along with EXO is always a great experience. Watch Chanyeol and Baekhyun’s “Tender Love” dance tutorial on SM Entertainment’s Official Youtube Channel. This is the only chance to enjoy EXO’s concert. Get some beauty rest, recharge, and have some energy and power for the eveof ElyXiOn In Manila! Have you read our 10 unforgettable moments from last year’s EXO Planet #3: The EXO’rDIUM In Manila? If you haven’t, read it now! If you’re in need of a more detailed throwback, pick up a copy of this year’s Annual K-POP Report (Issue #193) still available here. See you tomorrow at The ElyXiOn! It happens on April 28 at the Mall of Asia Arena.